I have absolutely no idea where I’ll be in a year. I’m not sure who my main hang will be or even what’s for dinner tonight. What I do know is that uncertainty can be exciting, brunch should happen every weekend, and ricotta should be in every pancake. I was thinking that I’d go out to Easter brunch this year, but then I started thinking about the pancakes and omelet of my dreams, and figured I’d make them at home! Because then you can eat Easter brunch at noon in workout pants with your hair in a disaster bun and sip coffee while sampling bite-sized pancakes. And these mini guys are currently, at this very moment, my absolute favorite pancake. They are super light and fluffy, thanks to ricotta, and honestly, peanut butter and chocolate are always a solid pair. These would also be delicious with honey and walnuts in them, or even granola. 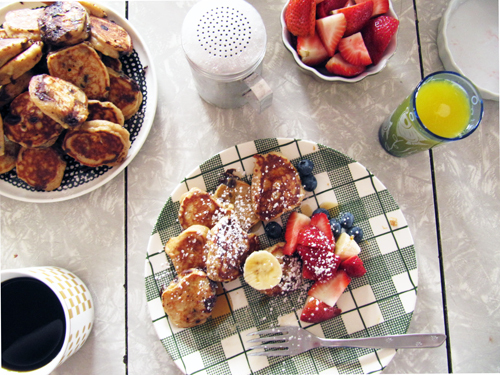 Live it up and make brunch at home all unclassy like. Place butter, milk, and peanut butter in a small saucepan over low heat. Stir until butter’s almost melted. Remove from heat and stir until butter is melted all the way. Whisk together the flours, baking powder, and 1/2 t salt. Set aside. Whisk together egg yolks, 1 tablespoon brown sugar, and vanilla in a large bowl. Add a quarter of the warm milk mixture. Whisking to combine. Slowly pour the rest of the warm milk while whisking. Mix until smooth. Fold in the flour mixture. Fold in the ricotta. Don’t try to mix it perfectly. It’s ok if there are ricotta streaks. Stir in the chocolate chips. In a medium bowl, beat egg whites until frothy. Add a tablespoon of granulated sugar and 1/2 t salt. Continue beating to soft peaks. Fold into the batter. Heat a griddle or nonstick frying pan over medium heat until warm. Sprinkle with water. When the water sizzles it’s ready! Lightly coat with butter or cooking spray. Using a tablespoon or a cookie scoop scoop the batter onto the pan. Flip in a minute or two, when pancake is half-way cooked. Continue until all pancakes are cooked. Keep them warm on a baking sheet in a 200F oven. 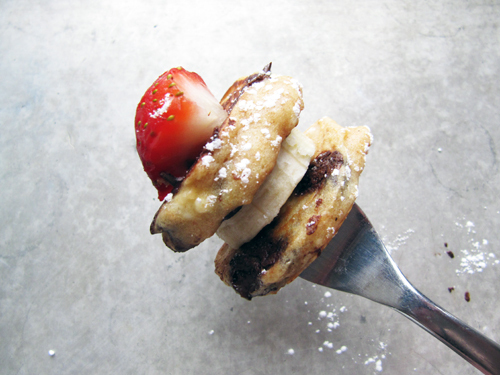 Serve with powdered sugar, maple syrup, nutella, and fruit. Brunch is my favorite meal. Ohmygod these sound so good Gurl!. I’ve always thought peanut butter and maple syrup should go together, so it sounds perfect in a pancake. p.s. I wish I could wear workout pants and have a messy bun and eat these. Yes! Peanut butter and maple syrup are a dream. And I LOLed about you with a messy bun. I just need to be your real life friend. I love your philosophy. 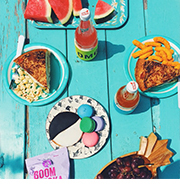 Life is better with brunch. And if I can enjoy brunch in my comfies looking like hell, even better! PS. 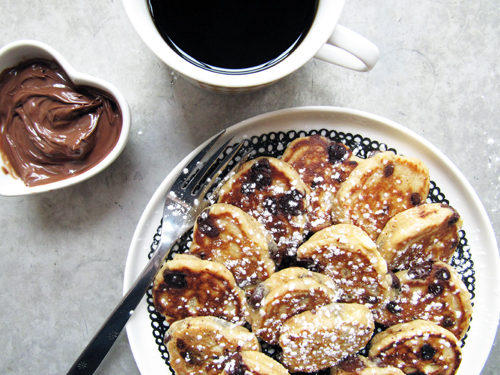 These little pancakes look amazing – can you believe I’ve never had ricotta pancakes before? Sacrilege, I know! It’s true, girl. AND ah! You need ricotta pancakes in your life right away! Let me know as soon as you’ve tried them. They’re love-worthy. Lawd, i love ricotta pancakes as much as I love peanut butter and chocolate and now I can weep and eat them all together at once. These are just TOO cute!! Mini versions of anything are adorable. Plus, I am essentially obsessed with PB! Thanks for sharing :). my grandpa and brother always put peanut butter and maple on their pancakes! and brunch is totes the best when it’s a carefree/messy hair sitch! Yeah girl! Love peanut butter and maple syrup together. yummy way to get protein! there are chocolate chips in the ingredient list but not in the recipe, i asume you mix them in the batter as well? Yep! Just mix them in after the ricotta. <3! You’re killing me. These are too cute, and need to be made immediately. I’m thinking of having a brunch party, putting these on skewers, and inviting no one so I can eat them all myself. i just made these all for myself, fresh fruit with them and oh my, i wish i never saw this post because this is simply too delicious!!! and a perfect way to start a lazy weekend, in my work out pants, looking like a mess! 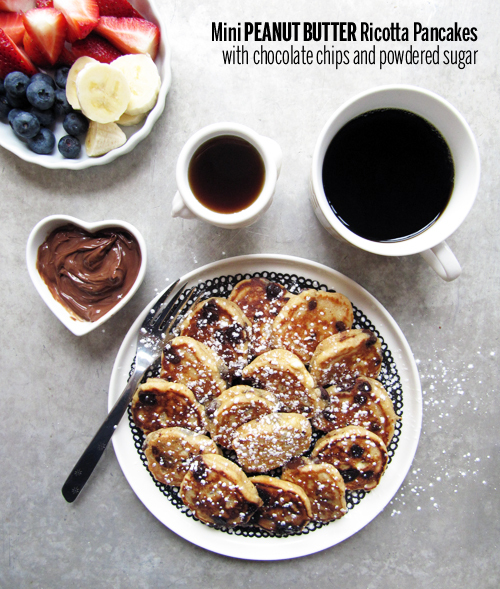 love it…..
i love mini pancakes and i love ricotta pancakes, i agree, all pancakes should be made with ricotta…. i just never made them with peanutbutter….my mistake! i have learned now…. 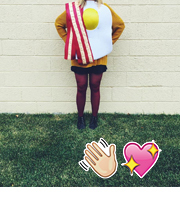 On another note, I was even more excited to find your blog when I realized you’re from Detroit. I live close by. Keep the delicious recipes coming! !